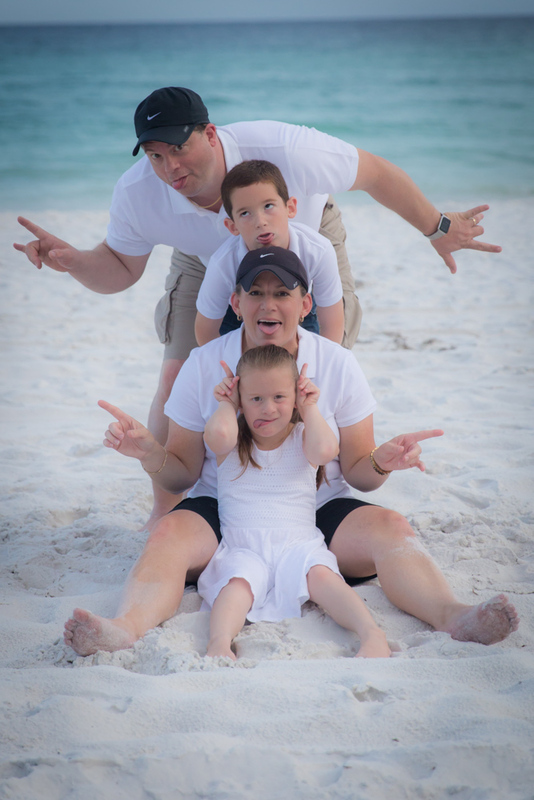 Well…summer is almost here, so it’s time to start thinking about our family pictures at the beach. Each year when we travel to Florida, I pack up my Canon 5D-Mark III, my Manfrotto 055 Tripod, and now my Strato II Trigger Remote or my Canon RC-6 Wireless Remote. Either of those remotes will work – the Strato II is more expensive, but does not need to be in the line of sight of the camera (it won’t show in pictures)! Probably everyone reading this post has attempted family pictures at some point – most of you do this every year like I do for Christmas cards. I don’t know about you, but sometimes I leave a session trying to take my own family photos in a pretty bad mood. It’s never stressful when I’m taking pictures for other people, but when it’s my family, it always gets a little crazy. I try to set my expectations very low, so if it goes well (and easily), I’m very pleased. 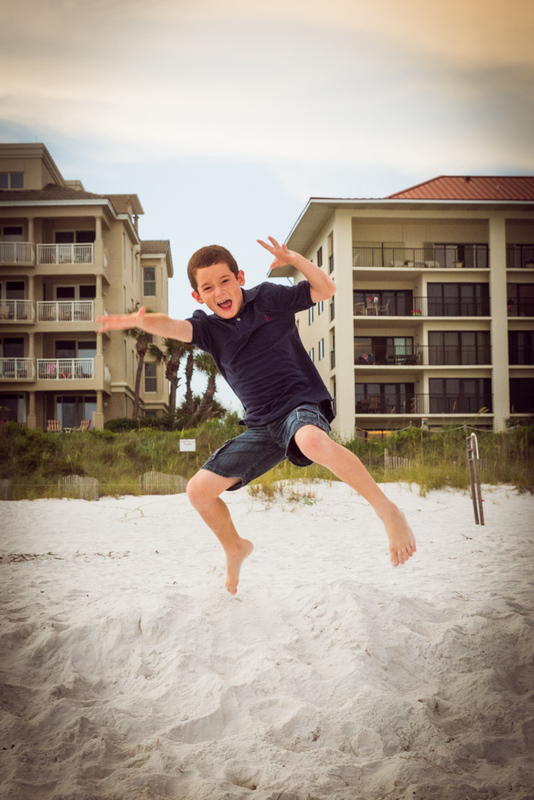 I recently read an article titled The Three Biggest Kid Photography Mistakes. It’s a great article, and a very helpful reminder for me as our family picture at the beach is quickly approaching! How Do You Get Your Children to Sit Still? The first thing they address in the article, is how most people ask small children to sit still and pose for the camera. I gave up on that notion a long time ago. However, now I’ve figured out a pretty good strategy that works with my kids (ages 9 and 6). For each serious/sit-still and smile picture they pose for, we can take 3 or 4 crazy, silly pictures – they get to pick what the pose is and where they want to take it (as long as it’s not in the water – we save that for the end of the photo shoot)! 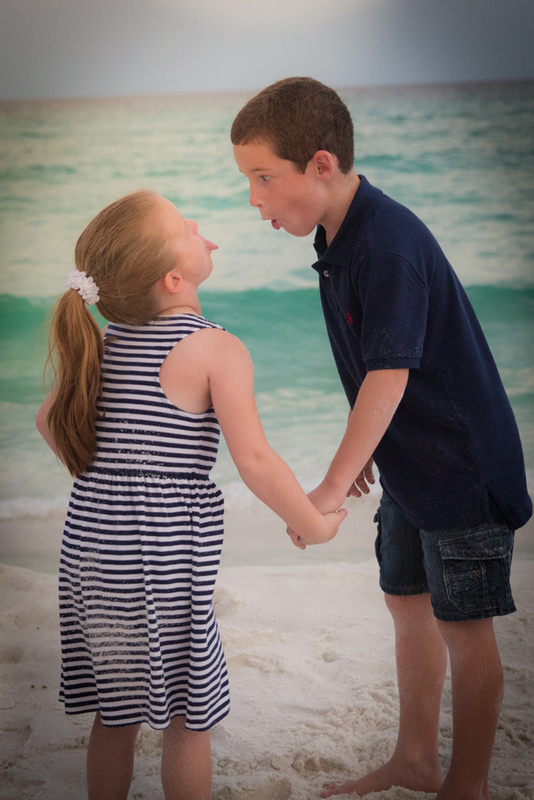 After many years of trying to get them to pose, I have come to realize that the pictures I love most are the silly ones or the shots of them playing together in the water or the sand. How Can I Make Sure I am in the Picture Too? So, in the picture above, I had not yet discovered the Strato II Trigger Remote or the Canon RC-6 Wireless Remote, so there was an added bit of excitement for the kids – – they got to take turns pushing the button on the camera to set off the timer. Then they had just a few seconds to make it back to where we were seated and get set for the picture. 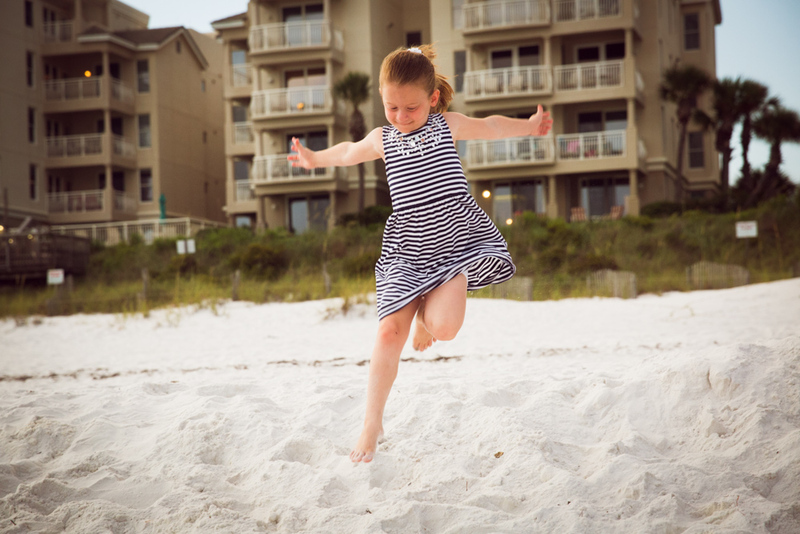 This proves to be very difficult because running in the sand is always exciting and presents many challenges – like not tripping and falling, keeping the sand off your pretty outfit, etc… But…it made it fun (for the kids). It can be done without a remote, it’s just a little more exciting and takes a lot longer! Should Everyone Always Be Looking at the Camera? The next thing the article addressed was how we are always asking our kids to “smile and look at the camera.” Just like sitting still, I gave up on that notion too. In fact, I have come to enjoy the pictures of my kids when they are looking at each other, or playing in the sand together. I have captured some pretty funny moments when they think I’m not looking. Some of my best shots at the beach have happened with my Canon EF 70-200 Lens – – when I’m using this lens, I can be so far away from my kids. It’s like I’m not even there. Their interactions are very different with each other when they think mom’s not around listening! And…I’m too far away to shout directions on where to look, how to sit, etc… So things just sort of happen naturally. Ha! I was so far away that they just started doing their own thing. I had asked them to look out at the beautiful water while holding hands – I was trying to get a totally posed picture that I had seen a family doing the night before when we were outside playing. Instead, I got this. Much more representative of my kids! The last thing the article addresses is how it’s important to be down on the kid’s level when talking with them. This I already knew – – having been a teacher for 15 years, I already knew that it was much more effective to be close to their faces when talking instead of staring down at them! And…when I’m taking pictures, I like to be on their level. Sometimes even lower – it’s fun to see things from their vantage point every now and then, and it usually makes for a fun, interesting picture. Here is Morgan doing some special tricks for the camera! They were done posing for me, so I let them run wild and jump and play. I ended up getting some pretty cute shots. Unfortunately, the sun was pretty low, so the lighting was hard, and there’s quite a bit of “noise,” but still some of my favorite pictures! And in true “Zach Form,” he had to do some special Ninja tricks for his crazy pictures! All that matters is that they were smiling. They weren’t sitting still, but like I said, this is pretty representative of my world! 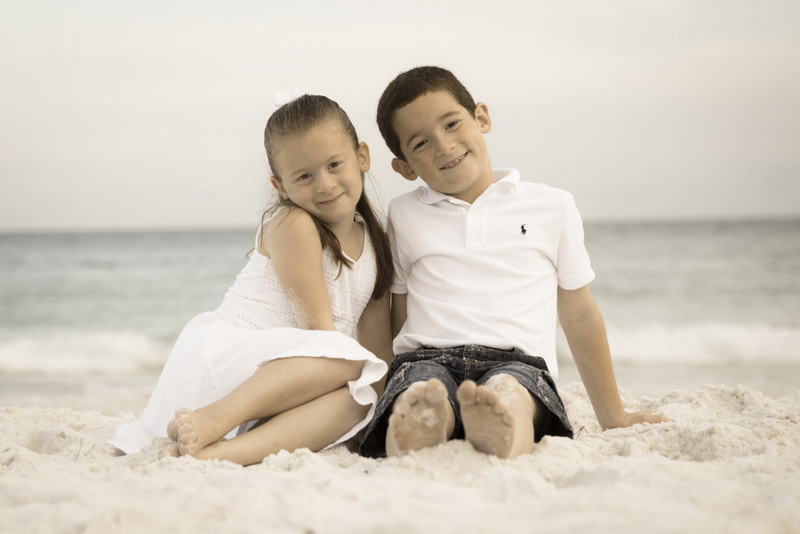 And here it is… My two sweet kiddos! All innocent and dressed in white! Ha! Fooled you, didn’t I? I had to bribe them with night time walks on the beach using flashlights to get this picture. 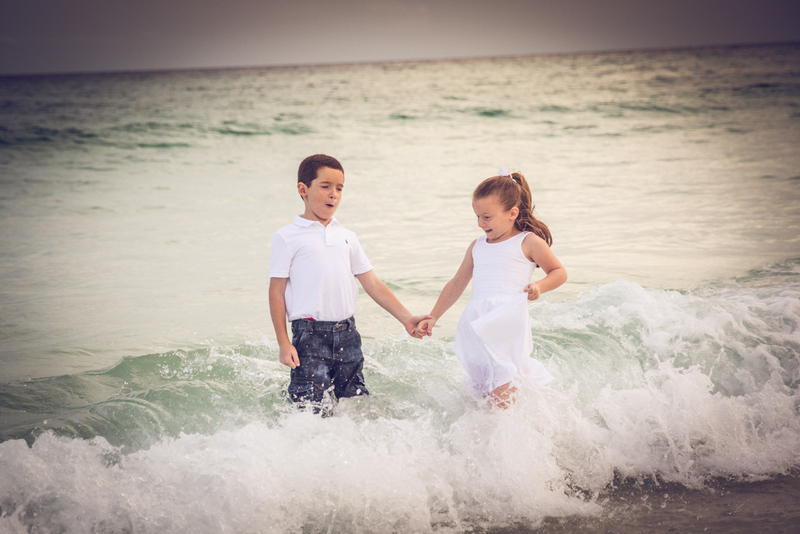 And…I told them that if they sat still, I’d let them get in the water in their “fancy” clothes for some fun pictures! So yes…occasionally, I love a sweet picture with my kids sitting still while looking at the camera and smiling! You better believe that this picture is framed and hanging up in my house! A picture this sweet is sort of like a unicorn sighting! And here they are…walking sweetly hand in hand in the water in their fancy clothes! This was the calm before the splashing storm! Something about letting them get their clothes wet?? ?